Welcome to the confusing world of colour harmonies. Essentially a straight-forward subject, colour harmony has become more complex and confusing than ever before… and it shouldn’t be. Usually technology has a way of simplifying things, making it easier for everyone to easily comprehend the topic it is enhancing. This is not one of those instances. You’ll see what I mean later. First let’s begin with what colour harmony (or a colour scheme) is. If you’re asking “what is it?”, then you’re like most people. What you may not realize is that you use colour harmony every day. You just have no idea that that’s what you’re doing. You do it when you get dressed and match your shirt with your pants, socks, shoes, belt and tie; or when you decide which flowers to plant in your garden and imagine how all the colours will look when they’re grown. You do it when you put your makeup on (for those that wear it) and you do it wherever colour choices are involved. Every time you buy a new shirt, you always think about which pant you can pair it with. You’re thinking about the colour harmony. Artists and designers do it all the time. Artists will chose colour combinations that control eye movement in their compositions. 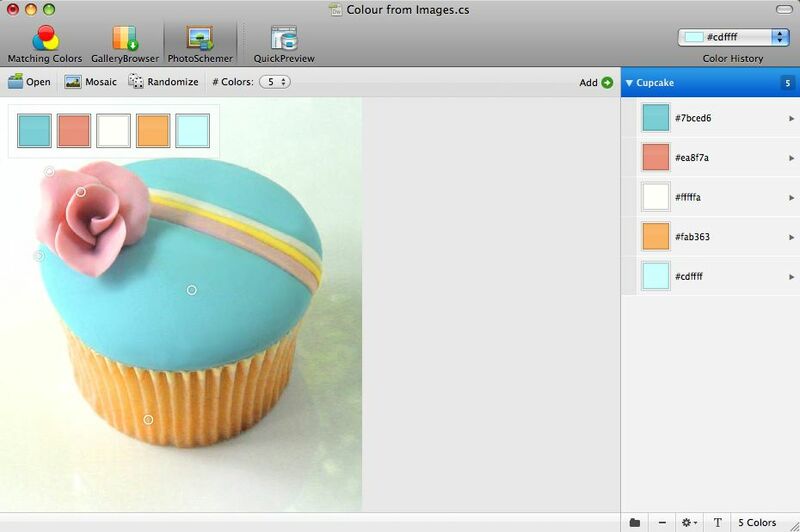 Web designers do it to make colours work together in a web page or graphic. Colour choice is so important to anyone working in web design. It affects everything and can be the deciding factor of whether your web design works or fails in its intention. People in advertising know about colour harmony. They use it to convince you to buy things and it works. They know that an ad created in striking colour harmonies will not only catch your attention, but provoke you to read it. That’s one foot in the door, for them and you have no idea how many times you’ve fallen for it. So okay, what is it exactly? Colour harmony is organizing colours in a pleasing manner following the rules of harmonic colour and there are 10 of them. It’s pure aesthetics at its basic level. Before anything is created, it’s figuring out which colours you will use. You need at least two colours to build a harmony, but you can start with one as a base colour. Everything else has to do with the relationship that colour has to all the others, and where they fall on the colour wheel. These colour schemes are built using the 12-hue colour wheel, also known as the artist’s colour wheel. The first colour wheel shows the harmonic rule in its purest form. The second wheel displays the same rule with the inclusion of tints (addition of white) and shades (addition of black). There are obviously hundreds more colours available to use, but for the sake of simplicity I’ve reduced the black and white variations to 4 hues per colour. The last group of colours are the colours chosen. Each of these images enlarges by clicking on them. The 10 different types of colour harmonies can be placed into 2 families. A colour scheme that contains various shades and tints of whites, blacks and grays, but no colour. A colour scheme of a minimum of three hues, which uses one base colour with individual tints, shades and tones of that colour. 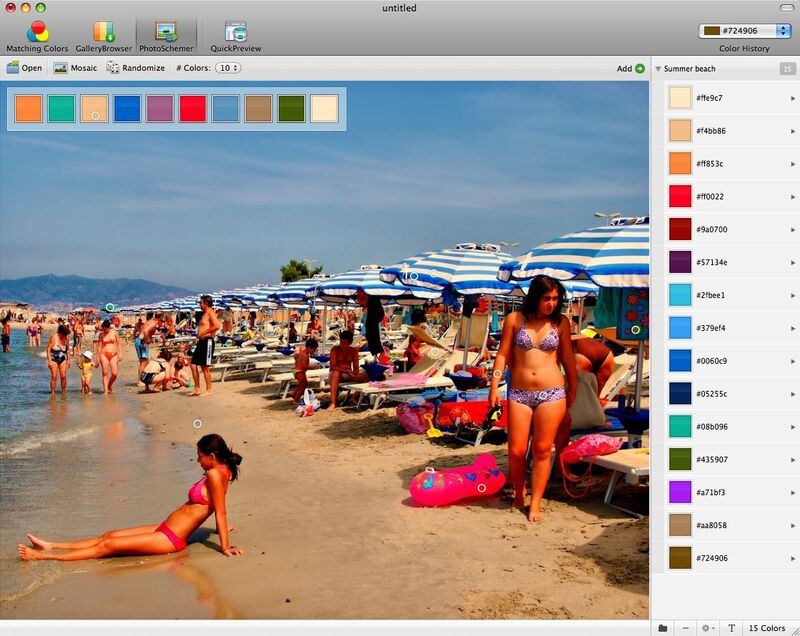 A 3 colour scheme which makes use of adjacent hues in which there is an identifiable common hue (e.g. yellow, yellow-orange and orange). Or at least 1/4 of a colour wheel. This object of three colours spins around to any three colour selection of the same intensity and can move in (adding white) and out (adding black) while retaining its structure. 2. Contrasting colour harmonies – Colour schemes which use two or more hues, with at least one warm and one cool colour. This colour scheme uses 2 hues which are not related and not quite complementary, provided the scheme includes one cool and one warm hue usually includes a hue which is one step away from the complement. (e.g. yellow and blue-violet). This object spins around to any two colour selections with one hue always to the left or right of its complement. It can also move in (adding white) and out (adding black) while retaining its structure. A colour scheme that uses 1 colour plus it’s opposite on the colour wheel. This object spins around to any colour, it’s complement should be directly opposite. It can also move in (adding white) and out (adding black) while retaining its structure. A colour scheme that uses 4 hues, including two adjacent hues and their respective complements. (e.g. yellow, yellow-orange, purple and blue- purple. This object spins around to any four colour combination hues. It can also move in (adding white) and out (adding black) while retaining this structure. A colour scheme that uses 3 hues which include a base hue and the two hues on either side of its complement. This object spins around to any three colour combination hues. It can also move in (adding white) and out (adding black) while retaining this structure. A colour scheme that uses 3 hues which are each 1/3 around the colour wheel. This object spins around to any three combination hues, while retaining this structure. Each arm can move in (adding white) or out (adding black). The two arms that are not the base colour can move independent of it while retaining this structure. Moving the base hue in or out, adjusts the two other hues proportionately. A colour scheme that uses 2 base hues which are 1 colour apart and include their complements. (e.g., red, green, yellow and purple). This object spins around to any four colour combination hues. It can also move in (adding white) and out (adding black) while retaining this structure.. So, now you know what designers know about colour harmonies, but how do you use that information to generate harmonies? 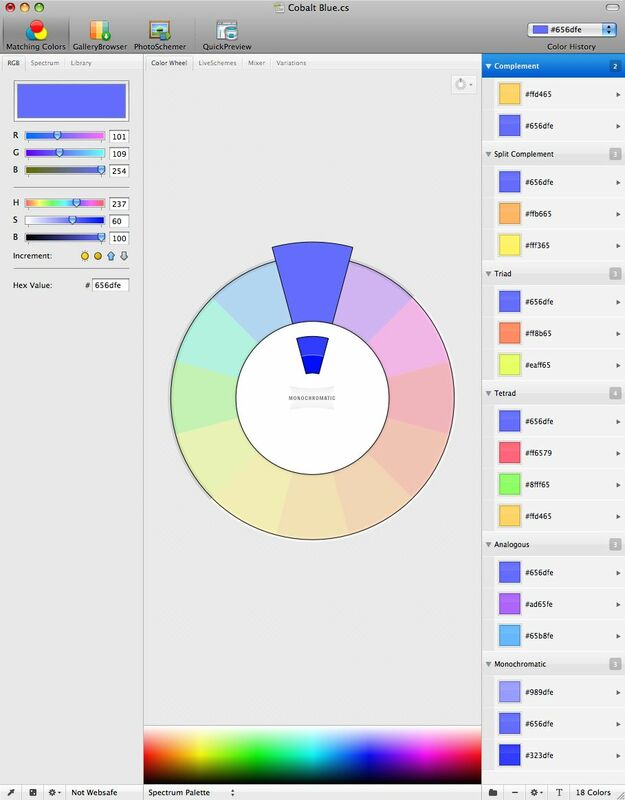 Typically, artists and designers use colour wheels to figure out colour harmonies that work. I myself have used wheels similar to the second wheel containing tints and shades with center pieces that spin around, similar to the objects used in the first wheel. Today, most of us will use digital software or websites that do exactly the same thing. Here are some examples. Many of you will probably have heard of Kuler at Adobe.com. It’s a great idea and you can specify harmonies based on monochromatic, traid, complementary, compound, shades and custom. These are all 5-colour harmonies that begin with a base colour. You can create and save your harmonies online and then download them as an Adobe Swatch Exchange (ASE) file which can be imported into any Adobe product. One of the best ideas at kuler was adding keywords to the swatch selections. I’ve always seen colour selection as something organic and keyword searches adds the words that most people will use to describe colours. This means you can search for other swatches using descriptive words like “spicy”, “vanilla”, “corporate” or “summer”. It’s free to create an account and it costs you nothing. Even if you don’t use the ASE files you can generate, you can always go back to your colour selections and visually match them to swatch books onscreen. Here’s walk-through of building colour harmonies based on a single hue, using Kuler. I started with a single hue… cobalt blue. I imported a Flickr image I found by searching for “cobalt blue”. I wasn’t concerned with any other colour in the image. This was the first set of colours it pulled from the image. I named it CobaltMint and made the blue my base colour. This is considered a custom mix because it doesn’t follow any harmonic rule. Once that was done, it was easy to edit my swatch as a new set. From here, you click on any rule to generate a harmonized set of hues. Kuler is by no means perfect. I’ve listed, what could be reduced down to, 7 traditional colour harmonies near the beginning of this post. Kuler really fulfills only 4 of them. Harmonies can be between a minimum of 2 colours (as in a complementary colour harmony), but Kuler wants a minimum of 3 colours to be able to share it in the public realm. You can create them, you just can’t share them. The lack of contrasting, double complementary, split and double split complementary, triad and tetrad colour harmonies is a little disheartening. It means if you were learning this stuff, you’d only be learning half of what you should know. 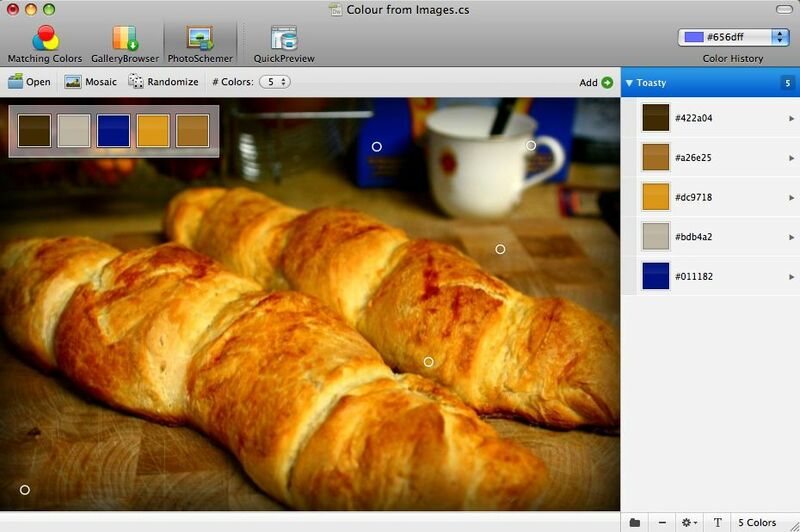 Another thing is it cannot select colours from an image and then re-adjust the hues to their closest match following a specified colour harmony. The compound and shade rules they offer… I’m not sure how they could help anyone trying to figure out colour harmonies. Here’s something else I found at Kuler. Take a look at this colour combination. According to Kuler, they are analogous to each other. I so disagree with this. If yellow is my base hue, how can this blue be analogous to yellow when it contains no yellow whatsoever? Something’s rotten in the state of Kuler, methinks. Which means if you use Kuler for colour theory, do it at your own risk. It’s clearly not as perfect as everyone would like to think. I’m not one for sitebashing, but please don’t promote this as a learning tool, escpecially when it comes to colour theory. One of the best pieces of software for generating colour harmonies from the desktop is ColorSchemer Studio 2, available in mac or pc flavors. It’s easier to save your selections in groups and re-organize them in any way you see fit. It also goes one step further than Kuler, with the addition of being able to to create split complement, tetrad and triad harmonies. You still can’t generate contrasting, double or double split complementary harmonies, but that may come in time. You can use the HSB sliders to add white (S) or black (B) or change the hue altogether (H). That’s flexibility that Kuler doesn’t offer. You can also save your swatches as ASE files just like Kuler and because it’s from the desktop, it’s far faster than Kuler. You can also select more than 10 colours! The harmonies are still single-hue based, but ColourSchemer is still far and away easier to use than Kuler. Look! 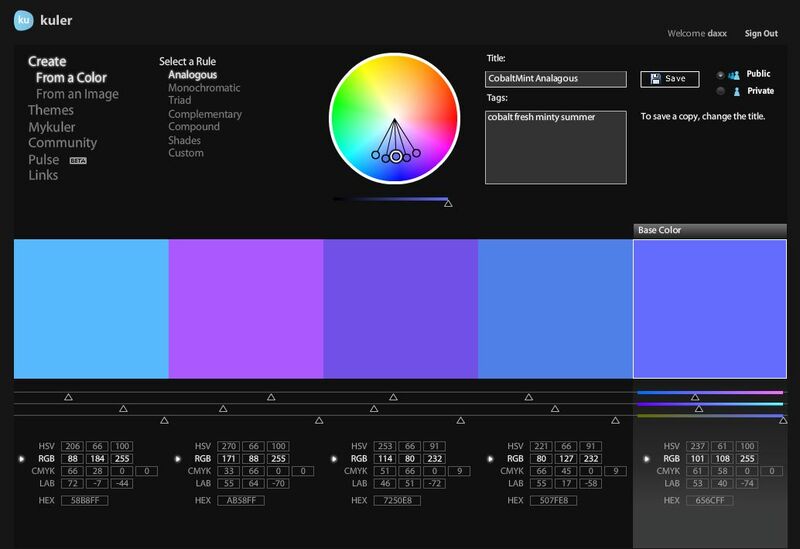 This is ColorSchemer allowing me to select more than 10 hues! I started with the 10 it selects from the image and then after modifying some of the hues, added them manually. There are 15 colours here! I can add or delete them as I see fit. I can import all of them into whatever I’m working on and try out each one before I keep or delete it. That’s the kind of flexibility I love in software. Because it’s standalone, I can do this anywhere without going on the net. To be clear, these colours do not follow any harmonic rule, they are simply sampled from the image, but each colour can be saved and then a harmonic rule can be applied to them later to build a set of harmonic swatches. Another great feature is it’s connection to COLOURlovers.com. It’s an entire web community of people who love colour. 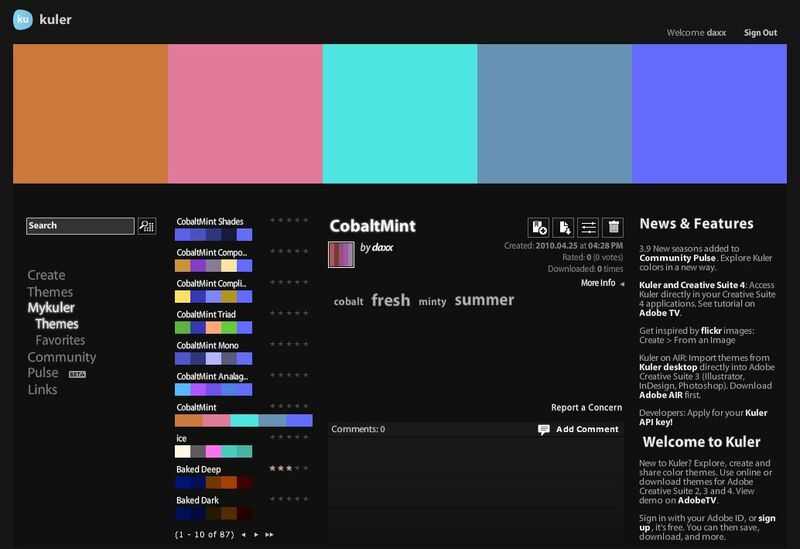 ColorSchemer allows you to connect to their website and download or your harmonic creations. You can also join their forums and just yak your heart out about colour, and who wouldn’t want to do that? Everyone has a viewpoint about colour. The community over at COLOURlovers is huge. It’s about fashion, design, web, print, home, patterns, swatches, and palettes… all to do with colour. They even have a great section on colour trends. It’s life, living with colour! What amazes me about this site is the scope of people that go there. Just like life!